You are currently browsing articles tagged sicily. 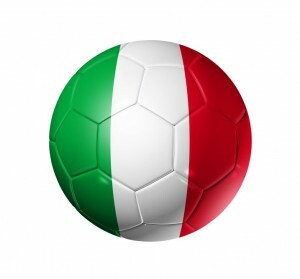 Sicily for me is the soccer ball that Italy is punting into Africa. The ancestral home of New York’s toughest mafiosos and not much else. With such a cartoonish understanding, it’s time to start with some color on Sicily. Fun facts on Sicily. Wikipedia Style. 1) Largest island in the Mediterranean. Size-wise, it’s triangular Vermont sailing off the southern tip of Italy, close enough to Tunisia to take an overnight ferry. 2) Syracuse, that ancient Greek city that historians will recall from the historian’s historian tale of alliances in the Peloponnesian War, was actually a Greek colony that sat on Sicily. 3) Many of the Christian martyrs killed in the Colosseum were Sicilian as Christianity took hold in Sicily long before it became fashionable (or permissible) in Rome. Sicily had a long history of fighting back against their Roman leaders. 4) Agriculture is today the principal driver economically (volcanic soil’s really rich and Mt. Edna is as volcanic as it gets), with oranges, pistachios reflecting a hundred-year Arab rule. Apparently, the Vandals, Goths, Byzantines, Normans, Holy Roman Emperors and French all brought no fruit when they each ruled Sicily. 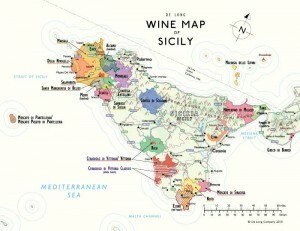 5) Sicily produces more wine than New Zealand, Austria and Hungary combined. Think about that the next time you see wines sorted by country in your local wine shop. So what kind or wine does a triangular island version of Vermont produce? The only wine from Sicily I’ve ever really seen on Italian menus is Nero d’Avola, a red grape that sorta tastes like Shiraz. Thanks to Nero d’Avola we winos can take that enormous tome of Italian wines that nobody has any idea how to decipher, flip through some pages like we know what we’re seeing and select a red bottle of wine called Nero d’Avola. Hooray! Victory! The villagers cheer as we defeated the Italian wine list! Nero d’Avola has that great blend of fun, delicious and Italian enough to lend some credibility to the meal we’re about to eat. Sicily’s more than a one-grape wonder though. Inzolia, today’s grape of note, is just one of a couple dozen different grapes that Wine Virtuosity (the blogosphere’s Madeira Maven and extremely knowledgeable, amusing wine guy) sampled on his recent 21 part series on Sicilian wines. Correct – that is a 21 part series, that makes Ken Burns look like a dilettante. And there are still others that exist too! Fun sounding wines like Zibibbo, Grillo and Primitivo. Just saying them out loud will make a child laugh. 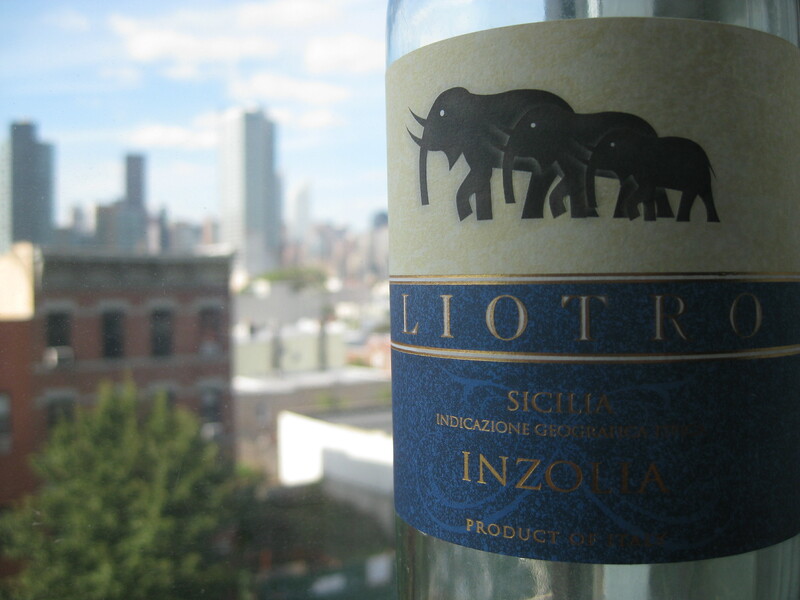 Inzolia – today’s grape – is a white wine that grows on the west side of Sicily (near where you take the ferry to Tunisia!). It’s not my favorite grape, much like Chardonnay isn’t my favorite grape, and it shares some of those similar round, oily characteristics that make the wine crazy popular. People with “I <3 Chard" shirts should be very about this grape when they can locate it in that enormous encyclopedia of Italian wines that comes with dinner. With my overriding bias for hugely lean, nearly anorexic wines, this grape had an uphill battle from the beginning. And if we're looking at a menu and Chardonnay and Inzolia are both listed, Inzolia's going to win (except maybe against Naked Chardonnay). This Inzolia’s got that citric promise that presumably comes from Arab oranges grown in Sicily. My five second tasting notes said – Citrus nose of lemon and lime with some oily smell but round body of cantaloupe, mango and a little pineapple. 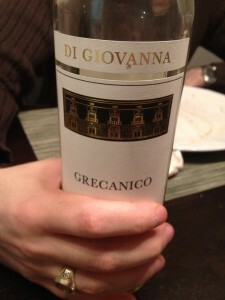 Extreme acidity with a pretty long finish for a white (even though it’s a thin finish). * Pronounce it “In-SOUL-ia” with that extra umpf in the middle to make it sound truly Italian. * Marsala (of famed Chicken Marsala) is a dessert wine made in Sicily thanks to a confluence of 18th century cultures (read its short genesis story here). Inzolia, along with Grillo and Catarratto, are the grapes that provide the Marsala building blocks.